The very same Israeli agents who had prior knowledge of the false-flag terror attacks of 9-11 – and who owned the electronic messaging system that was used to warn Israelis to avoid the World Trade Center on September 11, 2001 – are behind the NSA’s illegal and secret tapping of our phone calls. Is this just a coincidence or is it the conspicuous tip of Israel’s criminal operations in the United States? 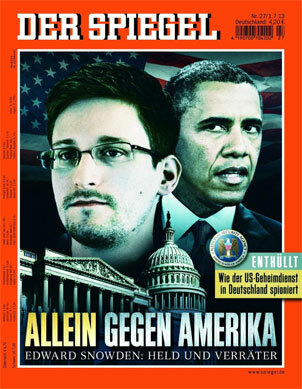 The latest revelations from Edward Snowden that the NSA is spying on the European Union is Der Spiegel’s current cover story. A current report in Der Spiegel says that the National Security Agency (NSA) has bugged European Union (EU) offices and gained access to its internal computer networks. It also reports that the U.S. spy agency taps half a billion phone calls, emails, and text messages in Germany in a typical month. To understand how and why the NSA spies on Europeans and Americans I recommend reading The Shadow Factory: The Ultra-Secret NSA from 9/11 to the Eavesdropping on America (2008) by James Bamford. The chapter that I found most interesting was “Wiretappers” in which Bamford discusses the Israeli connections to the NSA. This chapter describes how two Israeli companies are at the center of the illegal tapping of our phone calls and email and focuses on Jacob “Kobi” Alexander, the Israeli criminal behind one of them. It is amazing that patriotic Americans like Bradley Manning and Edward Snowden are hounded to the end of the Earth and prosecuted for their whistle-blowing actions to shed light on illegal activity, while the Israeli criminals, like Kobi Alexander, who are actually behind the criminal activity, are allowed to flee with their ill-gotten gains. Kobi Alexander, the Israeli criminal behind Verint, is tied to the terror attacks of 9-11. Why did the FBI allow him to send $57 million of stolen money to Israel and flee from justice while he was under investigation in June 2006? How does one wire $57 million to a foreign bank without the federal government knowing? Alexander, wanted by the FBI for a long list of serious crimes, was the former head of Verint, the Israeli company behind the snooping at Verizon. He was also part owner of Odigo, the Israeli text messaging company that was used to send warning messages to Israelis telling them to avoid the World Trade Center on 9-11. Alexander’s father, Zvi, who helped him acquire tens of millions of dollars illegally, is a former business partner of the late Marc Rich, the senior Mossad operative who sent two of his Belgian-Israeli agents to New York City to manage the shipping of steel from the World Trade Center to Asia – where it was destroyed. What is most telling about the bizarre relationship between Israel and the NSA (and FBI) is that those who expose the criminal activity are treated as criminals while the foreign intelligence service that is spying on Americans is completely ignored. The fact that Israeli intelligence has secret access to all our private communications means that it is able to use blackmail and other methods to control our politicians. Such criminal tactics may explain why criticism of Israel is so rare in Washington, D.C. It is important to understand how the Israeli connection to the NSA gives the Israeli secret service access to all of the data that comes through the massive collection of our private phone calls and email. The Israeli hardware and software at the center of this spying give the Israelis access to all of this data in the same way that having an Israeli security company working at our airports gives them the keys to the back-doors. According to a former Verizon employee briefed on the program, Verint, owned by Comverse Technology, taps the communication lines at Verizon, which I first reported in my book The Shadow Factory in 2008… At AT&T the wiretapping rooms are powered by software and hardware from Narus, now owned by Boeing, a discovery made by AT&T whistleblower Mark Klein in 2004… What is especially troubling is that both companies have had extensive ties to Israel, as well as links to that country’s intelligence service, a country with a long and aggressive history of spying on the U.S. While such tools as DCS-1000 [Carnivore] and CIPAV are used on a small number of select targets, Verint and Narus are superintrusive – conducting mass surveillance on both international and domestic communications 24/7. What is especially troubling, but little known, is that both companies have extensive ties to a foreign country, Israel, as well as links to that country’s intelligence service – a service with a long history of aggressive spying against the U.S. Equally troubling, the founder and former chairman of one of the companies is now a fugitive, wanted by the FBI on nearly three dozen charges of fraud, theft, lying, bribery, money laundering, and other crimes. Although there has long been Congressional oversight of the telecom industry, there is virtually no oversight of the companies hired to do the bugging. Thus, virtually the entire American telecommunications system is bugged by two Israeli-formed companies with possible ties to Israel’s eavesdropping agency – with no oversight by Congress.